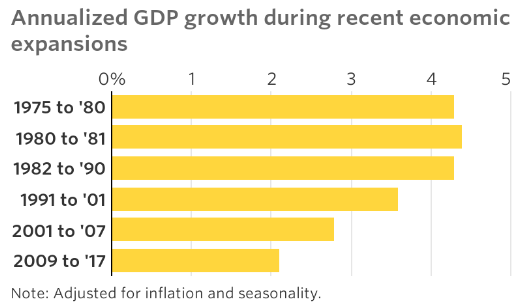 The current economic expansion, beginning in June 2009, is now one of the longest in recent years. Furthermore, low-wage workers are beginning to see bigger gains in pay. Since the rate of inflation is still remarkably low, under 2% annually, the expansion may well continue for some time. The primary negative factor is the relatively slow rate of growth averaging just 2% since June 2009. But two economists, Michael Mandel and Bret Swanson, have just issued a remarkable report, “The Coming Productivity Boom,” on behalf of the Technology CEO Council, predicting that the diffusion of information technology into physical industries is likely to boost economic growth to 2.7% over the coming 15 years. The next waves of the information revolution – interconnecting the physical world and infusing it with intelligence – are beginning to emerge. Increased use of mobile technologies, cloud services, artificial intelligence, big data, inexpensive and ubiquitous sensors, computer vision, virtual reality, robotics, 3D additive manufacturing and 5G wireless technology are on the verge of transforming the traditional physical industries – healthcare, transportation, energy, education, manufacturing, agriculture, retail and urban travel services. 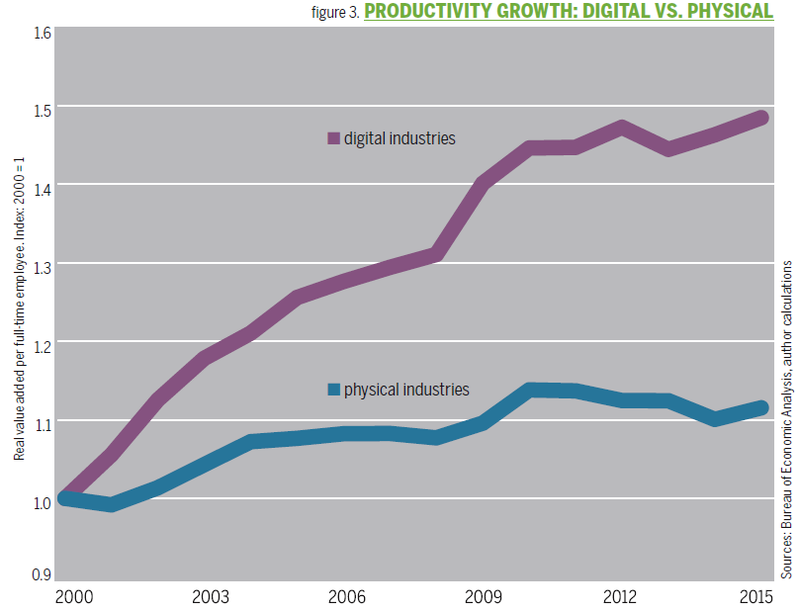 At 2.7%, productivity growth in the digital industries over the past 15 years has been strong, compared with only an anemic .7% annual growth in productivity in the physical industries. The digital industries, which account for 25% of U.S. private sector employment and 30% of private sector GDP, make 70% of all private sector investments in information technology. This “information gap” means that the physical economy is operating well below its potential, dragging down growth and capping living standards. The coming transformation could boost annual economic growth by .7% over the next 15 years. This would add $2.7 trillion to annual economic output by 2031. Policy changes will be needed to achieve maximum growth. Better tax policy can encourage more domestic investment. Regulators will have to embrace innovation and technological change. Conclusion. “The information age is not over. It has barely begun. … But launching this new productivity boom demands a new, pro-innovation focus of public policy.” In turn it will lead to an increase of wages and salaries to workers of $8.6 trillion over the next 15 years. This entry was posted in digital industries, economic growth, information revolution, Jack Heidel, physical industries, productivity growth, Tecnology CEO Council and tagged digital industries, economic growth, jack heidel, physical industries, productivity growth by jackheidel. Bookmark the permalink.